It's been noted before in this space that strip malls can be an unlikely place to find good food. 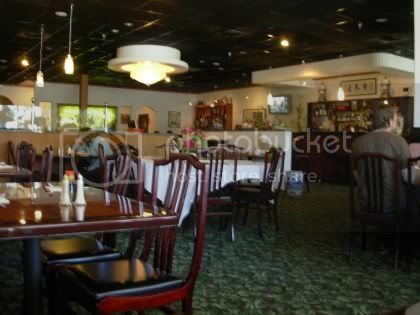 The many vacancies and low rent in Redding make them ideal for small family-run restaurants. Yuet Bistro is one such place. Yuet Bistro's interior is a bit more elegant and stylish than you'd expect given it's next to a tire shop and there's a parking lot just a few feet from the window. A long polished bar describes one wall; discreet hanging light fixtures cast a better glow on diners than ordinary florescent lighting. Lacquered chairs and tables are comfortably spaced apart so you don't feel like your neighbor could just reach over and take a bite off your plate. Service is prompt and ranges from friendly to perfunctory. So the interior’s nice. But how’s the food? With a menu extended between dim sum, Thai, Cantonese, Mandarin and Szechuan, Femme de Joie was a bit concerned that the kitchen wouldn’t be able to successfully accomplish everything they advertise. 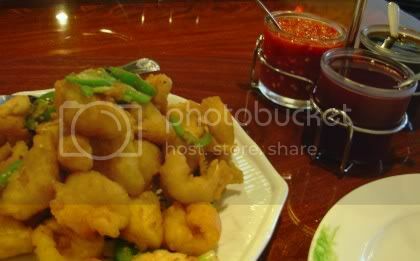 But M. de Joie is pleased to recommend Yuet Bistro for lunch or dinner, or a dim sum extravaganza. Prices are right for a speedy bargain lunch, but this is no fast-food express joint: the cuisine is elegant enough to take a date or enjoy a special occasion with family. Hot and sour soup - $3.50 cup, $6 bowl or available with lunch specials. Though it could have packed more heat, this warming and filling soup was nicely sour and was brimming with lots of crunchy julienned vegetables. 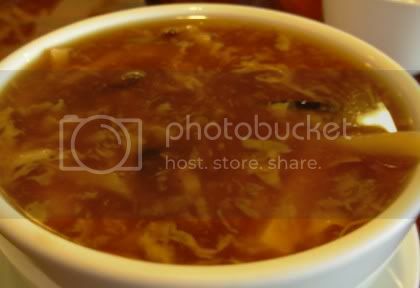 It was a pleasant surprise to find hot and sour soup is an option to go with lunch specials in place of the ubiquitous egg flower soup. 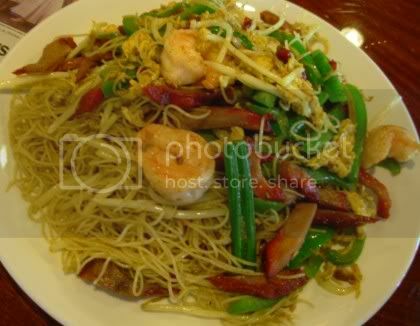 This was the weakest dish M. de Joie sampled at Yuet Bistro. Noodles, veggies, Chinese BBQ pork, and shrimp were all cooked beautifully. Unfortunately, the curry powder wasn't stirred in thoroughly. About half of the dish didn't have any curry and tasted very bland, and then suddenly there’d be a mouthful of pasty curry powder glommed onto the rice noodles. Too bad, because the other ingredients were perfect. 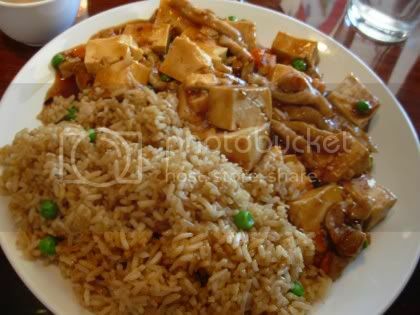 Ma po tofu -- lunch special, $6.95, including steamed or fried rice and a choice of egg flower or hot and sour soup. This was a terrific deal -- a very large portion of cubed tofu, strips of tender pork, diced carrots and peas in a gingery, not-too-sweet spicy-hot sauce, along with a generous amount of freshly cooked fried rice. Even an unreconstructed carnivore would enjoy this hearty special vegetarian dish with meaty textures. Ma po tofu can be made sans pork for a vegetarian dish. Salt-baked squid $8.95, enough to serve two or three as an appetizer to share. Salt-baked squid is not, in fact, baked but rather deep-fried in a light, puffy coating, with lots of browned slivered garlic, salt, fresh jalapenos, and dried chilies thrown over the top and served with hoi sin, sweet and sour, and garlic-chili paste. Femme de Joie could hardly stop eating this delicious, intensely flavored dim sum. Amico del Signore is not a squid fan but he loved this. 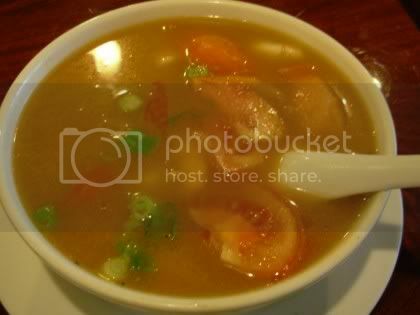 Thai tom yum seafood soup, $8.95 for a very large serving. M. de Joie loved this spicy and warming Thai soup, sour with limes in a strongly aromatic broth and filled with three green-lipped mussels and plenty of squid and shrimp. This is a soup for those who love assertive flavors and unexpected combinations of tastes. Now that the Cypress Street Bridge is complete and there aren’t 20-minute delays crossing the river, Yuet Bistro is easily accessible from downtown for lunch, or make a special evening reservation and enjoy some sophisticated Asian food in an attractive dining room.